Here's the pattern of global saving by sector. Government saving relative to government GDP hovers just a bit above zero percent. But back in 1980, households saved about 14% of GDP while firms saved about 9%. Those shares have now flip-flopped, with firms now saving 13-14% of global GDP, and households saving 7-8% in recent years. Meanwhile, investment across the sectors of the economy has remained much the same. 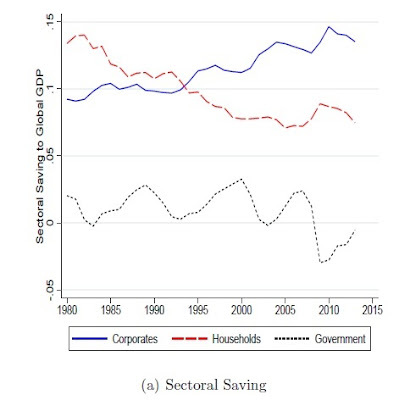 The authors sum up this change: "In the last three decades, the sectoral composition of global saving has shifted. 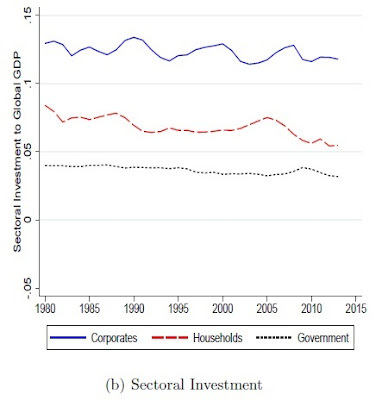 Whereas in the early 1980s most of investment spending at the global level was funded by saving supplied by the household sector, by the 2010s nearly two-thirds of investment spending at the global level was funded by saving supplied by the corporate sector. The shift in the supply of saving was not accompanied by changes in the composition of investment across sectors. Therefore, the corporate sector has now become a net lender of funds in the global economy." This change is not wholly unexpected, in the sense that it fits with other economic patterns that have been noted, like high levels of corporate profits and high levels of household borrowing. Sorting out the reasons why corporate savings have become so large are still being investigated. But at this stage, the authors point out that the pattern is theoretically consistent with a model that includes lower levels of real interest rates, lower prices for investment goods, and lower corporate income tax rates. This shift in the source of global saving represents a shake-up in the global financial system. For example, it means that firms become less likely to turn to external capital markets when raising money, because they can use their own savings instead. At some ultimate level, of course, firms are owned by people, like shareholders and other owners. 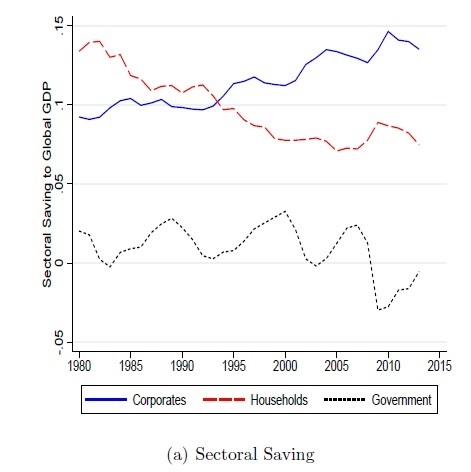 Thus, one way to describe this shift is that the underlying parameters of the global economic system have shifted so rather than households saving funds directly, households now use firms as the mechanism through which they save. How Close is the EU to a Single Market in Goods?